Are you thinking about having a tree or several shrubs removed? If so, winter is the best time for removal. When the ground is frozen, the Grosh's Lawn Service team is able to quickly remove the tree or shrub without causing much stress to your lawn. 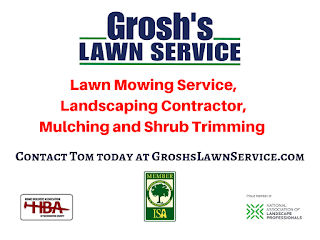 Learn more by watching Tom and the team at Grosh’s Lawn Service remove some boxwood shrubs in this YouTube video. You will be surprised in the unique way the team was able to keep all the dead leaves from falling out of the boxwoods onto our client’s lawn and avoid a nightmare of a cleanup.